?Monsieur Ouvrard / Comte Apraxin? Breguet, No. 680/3048, case No. 3048. Repetition à Ponts, sold to Monsieur Ouvrard on 10 Ventose, an 9 (February 28, 1801), for 1500 Francs, re-purchased and re-sold to Count Apraxin on April 1, 1818, for 1400 Francs. 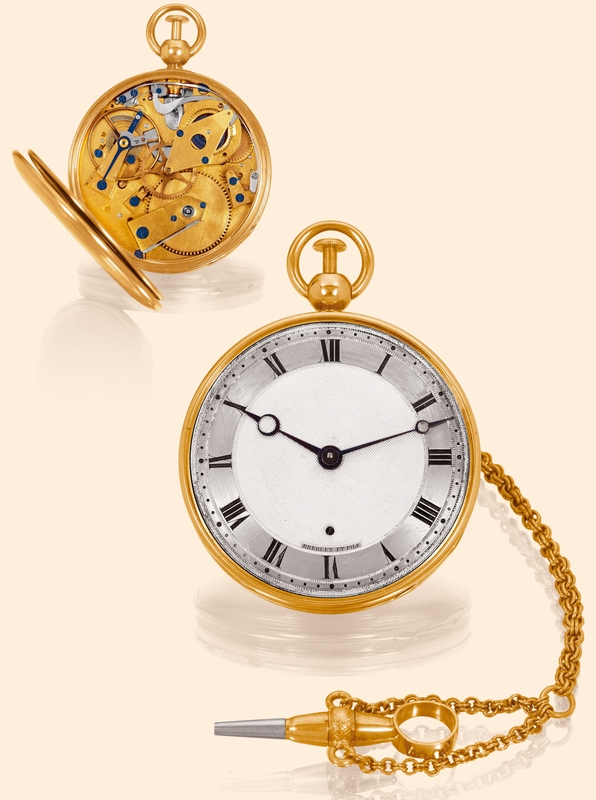 Very fine and rare, 18k gold quarter-repeating pocket watch with ruby cylinder escapement, short gold chain and key. C. Four-body, ?Empire?, engine-turned. Hinged gold cuvette. D. Silver, engineturned, brushed chapter ring with radial Roman numerals, outer minute track with dot markers. Blued steel Breguet hands. M. 42 mm., frosted gilt, bridge caliber, standing barrel, ruby cylinder escapement, the escape wheel with jeweled pivots, three-arm brass balance, flat blued steel balance spring, bimetallic temperature compensation curb fitted to the index regulator, repeating with a single hammer on a gong activated by a pull-and-twist piston in the pendant. Dial and cuvette signed. Case and reverse of dial punch numbered. Diam. 47 mm. C. Four-body, Empire, engine-turned. Hinged gold cuvette. D. Silver, engineturned, brushed chapter ring with radial Roman numerals, outer minute track with dot markers. Blued steel Breguet hands. M. 42 mm., frosted gilt, bridge caliber, standing barrel, ruby cylinder escapement, the escape wheel with jeweled pivots, three-arm brass balance, flat blued steel balance spring, bimetallic temperature compensation curb fitted to the index regulator, repeating with a single hammer on a gong activated by a pull-and-twist piston in the pendant. Dial and cuvette signed. Case and reverse of dial punch numbered. Diam. 47 mm. Apraxin Count Vladimir Stepanovitch Apraxin (1796-1833) married Countess Sophia Tolstaya, known as "Princess Moustache" in St. Petersburg high society. She was the daughter of Count Piotr Alexandrovitch Tolstoy. The Count's friends loved him for his kindness and, according to contemporaries, he was "a very gay, lively, clever, and well-educated person." He participated in the War of 1812 and the Russian campaigns against Napoleon from 1813 to 1814. He was rewarded for his participation in the battles at Dresden and Kulma. In 1814, the Count was transferred to the Cavalry. He became aide-de-camp to Emperor Alexander I. In the portrait, he is depicted in the uniform of the Colonel of the Cavalry Life Guards Regiment. He was promoted to the rank of colonel in 1824.